the microchip age or just born. and do have their microchip details listed below. Please contact us via email or phone if you want to chat about the below-mentioned kittens, or want to ask us for any further information or queries on reserving one of our gorgeous kittens mentioned. Breeding cats also Occasionally Available on Application. **We have a written legal contract that is to be signed by all parties involved in adopting a cat or kitten from us. It can be seen on the Adoption Contract page. A non-refundable deposit of $300-00 for Pet kittens and $500-00 for Show/Breeding kittens is required to make sure you get that kitten of your dreams. We would also like to bring to your attention that the date you see on our Kitten listings below that state they are ready to go to their new homes from IS the earliest date available to leave our home, unless we advise otherwise. It is due to our years of experience in Breeding and raising our cats, that has allowed us to know the best time for them to leave, to give the new owners the best chance at having the best cat possible. As much as we love seeing people secure the kitten they fall in love with from us, unless this is a FULL deposit amount, and that communication is also followed up on from that interested party, we reserve the right to place that kitten with the next interested person. If you are interested in putting your name down as a possible adopter, please email Terri-Ann with your details and a bit about yourself so I can email you with updates. 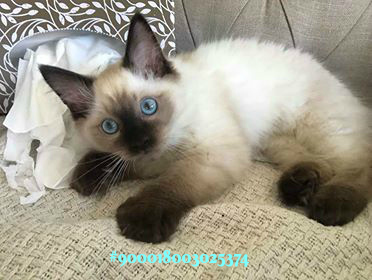 Born on the 3rd of October 2018, this young desexed boy, the gorgeous Seal Point named Furrballz Colonel Potter, is unfortunately looking for a new home. He is currently with his first family over near Tullamarine VIC and our normal guarantees and ongoing help and advice will continue with him! Please contact us for any upcoming babies we may have, or have planned. When we do have babies available as pets, they have all been micro-chipped, desexed, vaccinated, wormed and guaranteed against PKD & HCM for 4yrs. All kittens leave us with a comprehensive kitten information and food pack, as well as our availability to help and advise for the life of the kitten. We will have more babies with different patterns and colours available, depending on the matings we have done. Please do contact Terri-Ann and visit the Furrballz Ragdolls Closed Group on Facebook for more up to date information.